The letterpress from Lifestyle Crafts, or L, sets the standard for easy to use, affordable letterpress printing that's practical for any home crafter. Information on the L Letterpress can be found on the Lifestyle Crafts website. The L Letterpress was designed to use the KF152 deep relief plastic backed photopolymer plates. These plates can be ordered directly from our website. 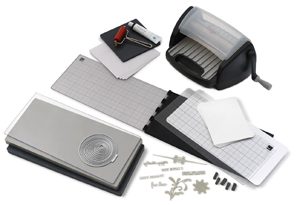 Setup and registration is super easy with the plastic grid base of the press and the adhesive backing that the plates come with. Just peel the protective plastic away from the photopolymer plates, stick the plate onto the base of the press and start printing. If you have a file that you want output and are familiar with most design programs you can submit your files to us directly through our website. All you need to do is create a user account here so you can upload your files. If you need a refresher course in setting up color separated files for output please see our File Preparation page for simple instructions on how to do this. If you are not familiar with file preparation and want to talk to us about your specific needs please feel free to call us and we will be more than happy to answer any questions you may have.